A ground-breaking garden at the inaugural RHS Chatsworth Flower Show (7th to 11th June 2017), is set to explore the effects of climate change up to 2100. In a collaboration between the Royal Horticultural Society (RHS) and Sheffield University, the small suburban garden, set next to a garden of the year 2100, will highlight how climate change could affect UK gardening. ‘The RHS Garden for a Changing Climate‘, designed by Andy Clayden and Dr Ross Cameron of Sheffield University and RHS Scientist Dr Eleanor Webster, will highlight the impacts of climate change on gardens as well as feature plants that will be able to cope with its challenges. 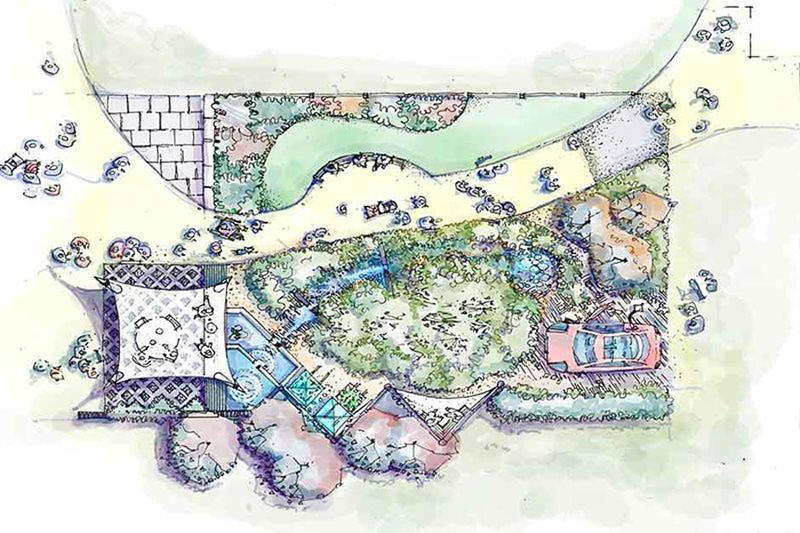 The garden will be split by a sweeping path separating how gardens look now and how they might look in the future. Dr Webster points out that the recent report provides us with really important information about the challenges gardeners will face and how the Show Garden is their visual expression of the results: “It provides real insight into how gardeners can continue to garden successfully into the future, including the specific plants that are best equipped to thrive in the new conditions. The garden also highlights the critical role that gardens will play in climate change mitigation and adaptation,” she says. The Chatsworth garden will incorporate flexible spaces encouraging us to spend more time in our gardens and take advantage of milder winters. Innovations include a canopy that can be quickly erected to provide shelter in the event of a downpour – this also captures rainwater and directs it to storage tanks/ponds for use in times of drought. Garden boundaries have been reconfigured to create stronger, more robust edges that are resilient to wind and there is greater use of permeable surfaces as well as water capture and storage facilities. Glass structures introduce temporary shelter to protect some of the newer, more sensitive plants and recycled aggregates and a porous pavement replace the traditional impermeable patio and tarmac parking bay.